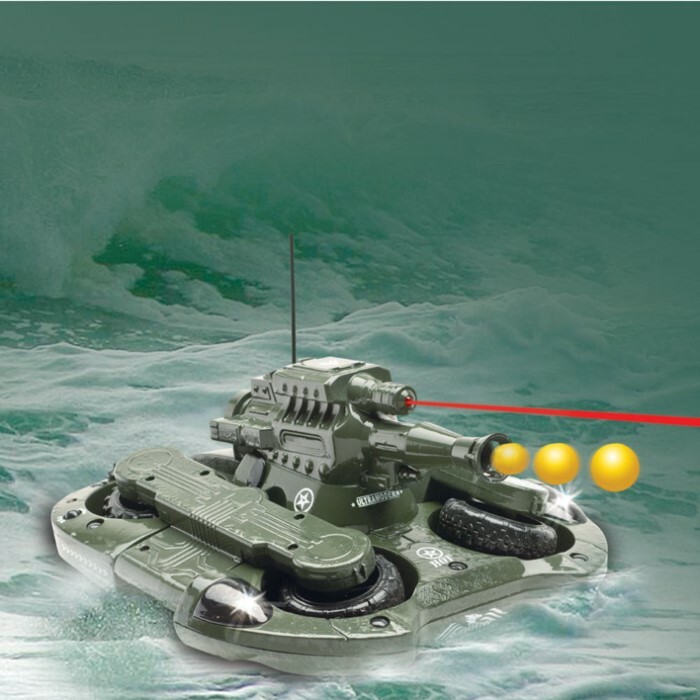 Remote Controlled RC Amphibious Tank Green | BUDK.com - Knives & Swords At The Lowest Prices! 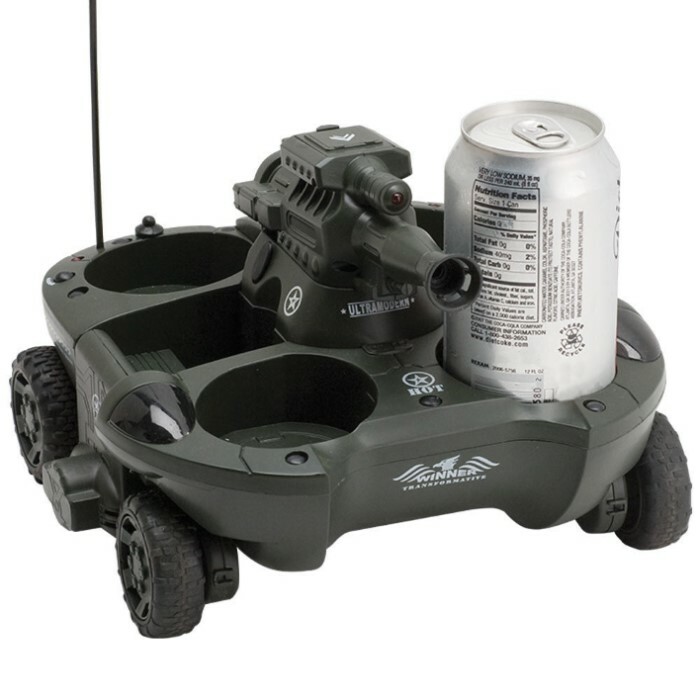 This all terrain tank shoots 6 mm Airsoft BB's, can deliver up to 4 cans of your favorite beverage on land, and automatically covert to a boat for water travel! This is a great toy. My grandson got it charged and going. 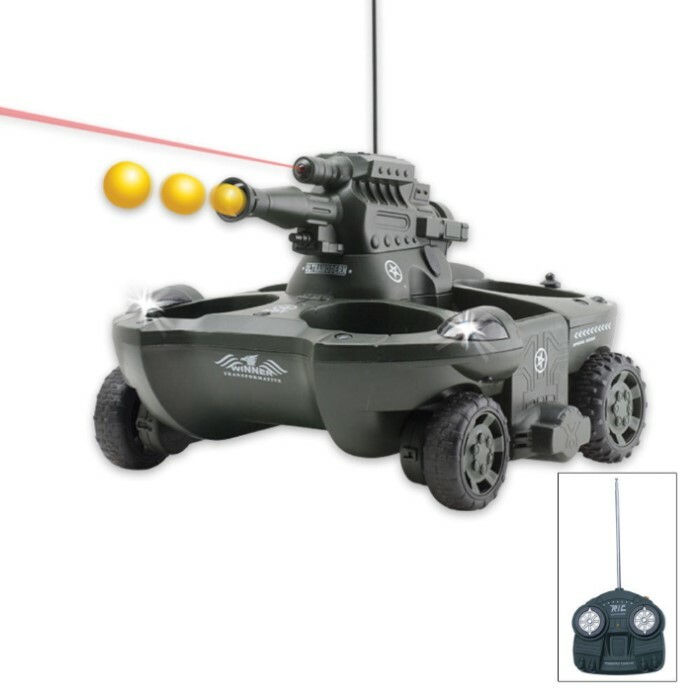 This toy transforms into a boat when a push of the button pulls the wheels up. It moves very fast and drove right off the deck into the pool. It was so cool to watch. Cannon works great. My granson received it as a Christmas gift. I am buying a couple more to keep at my house. Tank works well. Drives fast and shoots well. Haven't tried it on the water yet. Works well, very fast on the ground, gun shoots about 30 feet, decent battery life. One tire loosened and fell off, but JB Weld fixed it right up. Turns on a dime, like a real tank. My 8 year old has really enjoyed it. MY GRANDSON LOVED IT. WORKED PERFECTLY. GREAT GIFT. My boy loves this tank, and can't wait to get it on the water this summer. Seems to go well in the snow and shooting things is a plus! !